Washington DC area Jewish Day School Visits Chabad House On Wednesday, June 15th, close to 150 students of the Charles E. Smith Jewish Day School of Rockville, MD visited Chabad House in New Brunswick, NJ. After spending a couple of days in NYC the students of the Charles E. Smith Jewish Day School toured the largest Chabad House in the USA and witnessed first hand the construction progress of the 90,000 sq ft mega-facility featuring men's dorm rooms for 72 males, and a Dining Hall for 750 students. 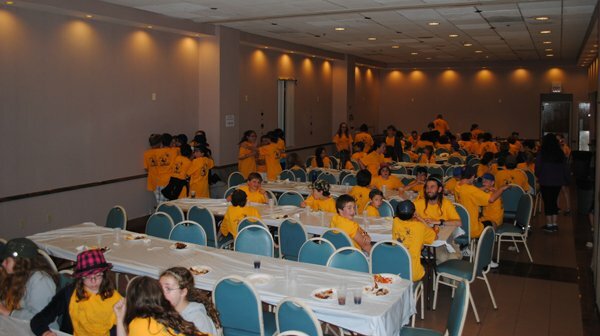 then had a delicious dinner served in the Chabad Dining Hall. A number of the students remarked how that were impressed with the Jewish presence on campus and look forward to coming back as college students. The staff accompanying the students remarked that although this was the first time in Chabad House - they will ensure that Chabad House is on the itinerary every year.